Interesting advertising wrap and backdrop. And see how easy it is to clean under this display? Another beautiful car. It makes our display platform look great! Plaza Tire Service was chosen recently as the Modern Tire Dealer - MTD Dealer of the Year. 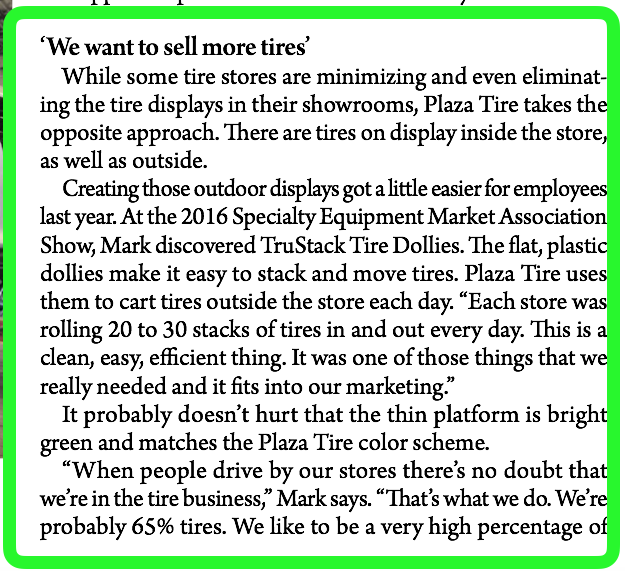 In that article, the TruStack Tire Dolly was featured as Mark Rhodes discussed his company's determination to "sell more tires." In it, he describes discovering the TruStack Tire Dolly at the SEMA Show in 2016. He describes how many of his stores roll out "from 20 to 30 stacks of tires every day." He then describes the way the TruStack became an "clean, easy, efficient thing" to roll out those displays. He said "It was one of those things that we really needed and it fits into our marketing." Here is a link to the article, these quotes coming from the section titled "We want to sell more tires." on page 50. Congratulations to MTD Dealer of the Year - Our Customer! Plaza Tire is one of our best customers and we are more than pleased that they received the MTD Dealer of the Year award! And it is really satisfying to see our TruStack Tire Dollies in the backgrounds of several pictures as this company takes their Street Displays seriously! They are quick to roll out at store open, and quick to roll in at store close. Those displays do not have to be rebuilt every day and they look so professional! Congratulations Mark and Scott Rhodes! The TruStack Tire Dolly has been issued a patent (US Patent 9,610,963) for its innovative tie-down system and for its clever and unique caster configuration. While major tire retailers enjoy strong brand recognition among their potential customers, small tire retailers have to inform every potential customer that drives by that they sell tires for a living. That’s why when you drive down a street with tire stores, it is common to see dozens of tires stacked out by the road in front of those stores. Those street displays are very time-consuming to build every morning and tear down every night. The TruStack Tire Dolly was originally invented to make those stacks safe and mobile, to help those retailers spend time on customers more quickly after opening their stores in the morning and to get home to their families just a little earlier every night. Two of the features of the TruStack Tire Dolly do that job so well and so uniquely that the US Patent Office agreed and issued a patent for it. The tie-down system on the TruStack allows the user to build a stack of tires nice and straight, loop the provided lash-strap through the top tire and then through TruStack base, cinching it tight to form a solid display unit on wheels. This keeps the tires from tumbling off the stack during a breeze or from little kids climbing the display. This system also helps protect the retailer from potential physical damage to both people and property from that tumbling tire. The other noteworthy claim issued with the patent has to do with the casters. The TruStack Tire Dolly only uses commercial-grade sealed-bearing casters rather than dry bushings, but any competitor could have chosen those. The TruStack was also designed to ride on five casters rather than saving 20% by specifying four. But again, that could have been done by others. The really clever part was designing it to be easily controlled so that it could be steered down aisles, between cars, and on slanted driveways without the random movements of a typical furniture dolly. That is accomplished by specifying that two of the five casters be rigid non-swivel units mounted parallel to each other. The result is that the user can guide a full load of tires with one hand. Other significant features are combined with these patented features, such as a large 30” diameter, large 1000# capacity, carry handle, side strap guides, 2 brakes, and full 360 degree support for the load, but you can read about those on your own at www.ChariotConcepts.com. Of course, this means that those small town tire shops can deploy those street displays much more cost effectively than ever before, and with an extra layer of security as well. Dan Jensen is inventor of the TruStack Tire Dolly and the owner of Chariot Concepts LLC which was founded in 2015. Dan spent 36 years working in and managing tire stores for Les Schwab Tire Centers in the West before retiring to start Chariot Concepts LLC. Dan likes to explain that he creates the tools he wished he’d had while running those tire stores. The first product created for Chariot Concepts was the TruStack Tire Dolly which debuted at SEMA in the same year, winning a Global Media Award for New Products in the process. How many times have you tried to bill out a customer tire that had been left for repair but you could not find the work order that the tech swore he stapled to the tire? It doesn't help that the customer waited 4 days to come back and get it, and that the storage area is in the work-bays near the open doors exposed to wind and rain. And then there is the look you get from the customer as you pull the staples out of his tire that you just repaired because, well, a staple worked its way through. How embarrassing. Then there is the showroom display setup where you want to put some product data on the tread face of several tires in the rack or on a couple of mounted specials. You want to draw attention with a nice attractive bright tag, and the only way to attach it to the tire is with staples. Or tape. We've been imagining a solution and I think we nailed it. Hey, a pun. Anyway, we created a sleek looking Quick-Change magnetic sign clamp that attaches to the tread face of mounted or unmounted tires with an adjustable elastic strap. It hooks easily and lets you place signs of all types on tires from showroom to truck tire warehouse. And this is how it looks open, ready to receive your sign or work ticket. We thought this was pretty clean looking, and very versatile. 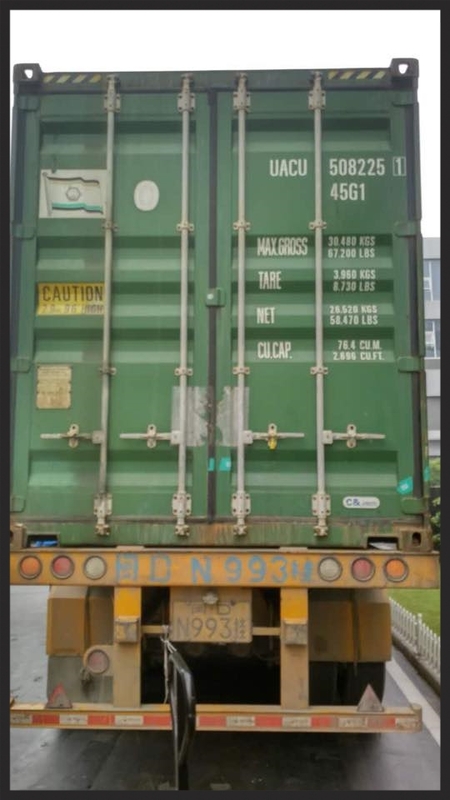 Another feature of this product is the ability to add a "billboard" to the back of it. That would be pretty cool to use with sale campaigns or logos. The device comes with double-stick tape on the back, so we just add a 4X6 card with your logo on it, or maybe you want it to say "Spring Sale!" instead. You can show off a permanent message at the top while changing out the product or price data as often as you like. Logo or sale card, plus website printed after bending the card 90 degrees at the top. The Adjustable Sidewall Signpost is here and in production! This one has taken awhile to perfect but it has been worth it. 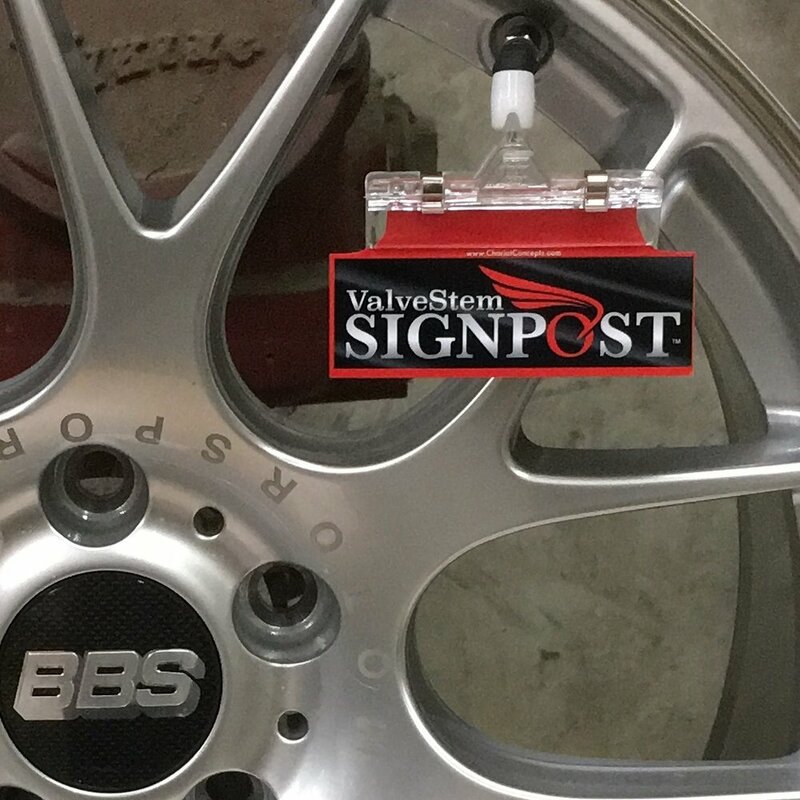 One part number (SS1520) fits tires sized from 15" to 20" and a second part number (SS2025) fits - you guessed it - tires sized from 20" to 25"
Your signs can be attached using double-stick tape, nuts/bolts, plastic panel fasteners, and even velcro. When we debuted the Sidewall Signpost at SEMA, we did so with open ears. The design we debuted was a fixed length design that would be ordered as needed for various sized tires. The feedback we got though was overwhelming, telling us to go the extra mile and make it adjustable. So we did. The final product is adjustable from 15 inches to 20 inches, so one part number will cover virtually every size disc provided in a standard ad kit. A second part number will cover from 21 inches to 26 inches! These will be in production within 30 days, so get your preorders in now! They stay in sometimes. If matched to the right tire. And if the double-stick tape is applied the right distance from the edge. And nobody touches it. Ever. And there is no wind. You really have to give these guys credit! Here at Chariot Concepts, we're always thinking. And this is one we've been thinking about for a long time. Last year when we thought up the TruStack Tire Dolly, we built it and introduced it at SEMA. We even won an award for it, and it's been pretty cool to hear the comments from people who love using it. Enjoyed a great day with the Tire Pros staff in Folsom California on July 5. Here are some of the photos we took that day! Tires can be strapped from the sides as well as the center. This allows the load to be well secured, especially if using them to support advertising "barrel stack" bags. And we all know what a pain those bag stacks can be when they shift or fall over! We continue to receive praise for the ease with which this dolly is steered with a load! One commenter pointed out that is took a few seconds to get used to, because you naturally want to push it in any direction, but this dolly has a forward, a backward, and a spin in place - but it does not have a sideways! The beauty of that is that it will go the direction you point it - but you do actually have to point it. It is best to remember to set it up so that the vertical tire is lashed down exactly parallel to the center anchor point crossbar. This will ensure that the lash strap serves as a directional cue. One look at the lash strap will tell you which way to push the dolly. I don't mean to pick on any particular store because this picture identifies an issue with almost every tire store I have ever been in: Inattention to detail when it comes to freestanding tire stack displays. I've changed the color to Black and White to help obscure the identity of the company involved. You get the idea. If these stacks were built on a TruStack Tire Dolly, and that work was done by a careful employee, maybe the one who built the stack on the left, they would be straight and true and mobile.